Shoot the dead… make them even deader? Some ammunition manufacturers are taking the chance of a zombie plague a little too seriously, me-thinks. Here’s the usually reliable Hornady (I use their hollow points for all my private black-op work) creating a real range of live ammo zombie stoppers. 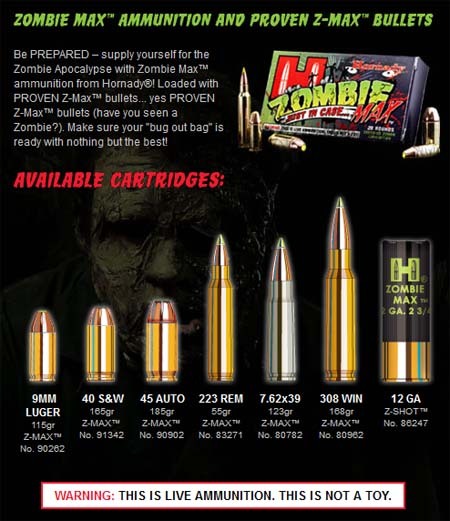 Be prepared – supply yourself for the zombie apocalypse with Zombie Max ammunition from Hornady. Loaded with proven z-max bullets…yes proven z-max bullets (have you seen a zombie?). Make sure your bug out bag is ready with nothing but the best! Warning: this is live ammunition. This is not a toy. It is intended only to be used on…zombies, also known as the living dead, undead, etc. No human being, plant, animal, vegetable or mineral should ever be shot with Hornady Zombie Max ammunition.